TOPSTAR PLC lamp has been designed and engineered for commercial applications that demand accurate color rendering and high performance. 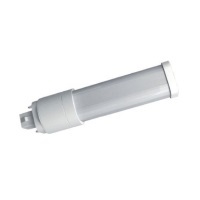 This plug and play direct replacement lamp is compatible with electronic ballasts and requires no rewiring during installation. This lamp features ballast output control technology which allows for high performance on lower powered ballasts. The base of the lamp can be rotated 300° to fit any socket configuration. For use with 13/18W electronic ballasts.